SYLVANIA, Ga. — Brandon Overton led all 50 laps to win the season opener for the World of Outlaws Morton Buildings Late Model Series Friday night at Screven Motor Speedway. It was his fourth career WoO LMS victory and his first since his big $30,000 payday at the Firecracker 100 back in June of 2017. Overton excelled in all areas of competition on Friday night. Qualifying sixth fastest out of 39 cars in the pit area, Overton sat on the pole for the second heat led all 10 laps. He redrew the outside pole, took the lead on lap one over polesitter Chase Junghans and never looked back, going flag-to-flag for Rum Runner Racing’s best finish with Overton behind the wheel of the Schaeffer’s Racing Oil No. 2. 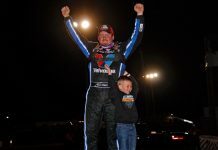 The big win to open the 2019 World of Outlaws season comes just two-and-a-half months after Overton and Rum Runner Racing went public with their plans to team up this year. 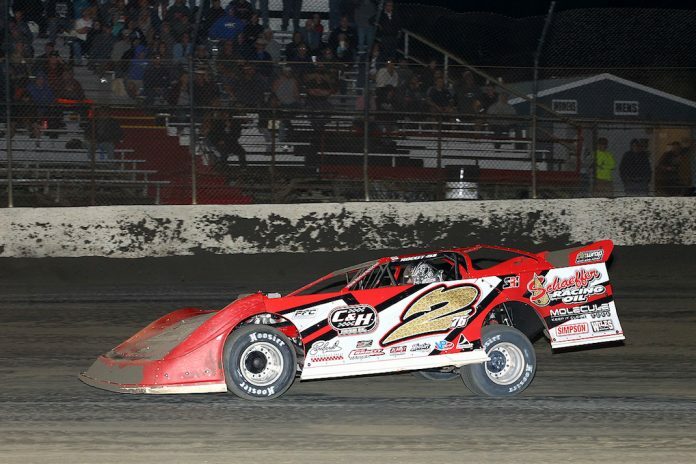 Former pilot Joey Coulter stepped down from his driving duties at the end of 2018 to make room for the 2015 Rookie of the Year, and the decision seems to have paid off well against the Outlaws. But Overton said it didn’t start out that way in his ventures racing elsewhere earlier this week. 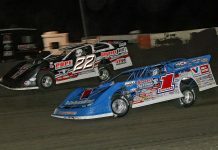 After two average finishes of 12th and 14th at Golden Isles Speedway and a dismal 23rd earlier this week at East Bay Raceway Park, Overton found his mojo on Wednesday and Thursday with a fourth and an eighth to give him a boost of confidence heading into Screven. Madden started directly behind Overton but had a costly miscue on the opening lap, jumping the cushion in turn three and lightly scrubbing the wall, throwing him all the way back to ninth before the first caution came out. Several yellows and even a red flag for Scott James and Boom Briggs, who managed to stack their cars on top of each other after a jingle in turn 1, gave Overton headaches all race long with constant restarts. This, much to their liking, gave Madden several opportunities to make up the lost ground and aided in Shirley’s efforts to keep up with Overton through lapped traffic. Madden got his new Skyline Motorsports Capital Chassis No. 44 straightened out rather quickly, getting back to fourth by lap 10. He finally broke into the top three with 15 laps to go, getting around Darrell Lanigan after chasing him for half of the race. 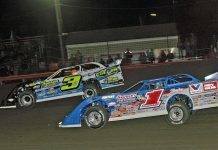 Then came the pass for second, when Shirley, who drove runner-up for nearly 80 percent of the race, slipped up in turn three with 11-to-go, opening the door for Madden’s slide job out of turn four.